What are the Chances of Winning a Lead Contamination Lawsuit? Poisoning by lead-based paint continues to be an unspoken epidemic in America, especially among children, toddlers, and infants. Statistics maintained by the CDC (Centers for Disease Control and Prevention) reveal that approximately 54% of children living in poor neighborhoods and 12% of children living in middle-class and affluent neighborhoods inhale and ingest enough lead each year to significantly drop their intellect quotient (IQ). The federal agency states that levels of five micrograms or less can cause significant problems like diminished academic abilities, adverse behavior changes, and the inability to stay focused. Sadly, most of the severe health issues associated with lead poisoning are irreversible. Rosenfeld Injury Lawyers LLC represents families with children suffering severe side effects caused by lead exposure and other types of professional negligence. Our law firm has extensive experience in resolving cases for our clients who are suffering from many of the horrific side effects of long-term exposure to lead-based products. Our attorneys are available to answer any legal question on how to receive the monetary compensation your family deserves if your child was diagnosed with elevated blood lead levels. Should you have additional questions, we invite you to contact our office for a free review of your legal rights. The damaging health effects caused by lead exposure can be catastrophic, or deadly. If your child suffers from lead poisoning caused by a neglectful landlord or home seller, you might be entitled to receive monetary compensation for your financial costs, and long-term medical expenses. However, Illinois civil tort law concerning premises liability can be challenging. Because of that, many families will hire a personal injury attorney who specializes in lead poisoning cases to ensure the victim receives adequate recovery funds to last a lifetime. You might have the legal right to file a lawsuit or claim for compensation based on lead poisoning. However, winning the case can be challenging. Many attorneys working on behalf of the defense have proven strategies to divert responsibility to the victim's family for the child's lead poisoning caused by eating paint chips. The strategies are designed to show that the child's behavioral problems, mental deficits, and stunted growth are the result of environmental factors (like a dysfunctional lifestyle at home) instead of exposure to toxic levels of lead. The defense attorney might state that the victim's family moved around a lot and rented different units in various areas in the city, county, state or another state. The lawyer might attempt to discredit the victim's family members by showing that they are unemployed, drug addicts, or have other issues that might have contributed to the child's problems. The statements made by the defendant's attorneys might be useful at diluting the lawsuit or compensation claim by placing the child's damages and poisoning on others. A competent lead poisoning injury attorney working on behalf of the injured victim can fight aggressively and push back on the defense's strategy. The lawyer might show that the environmental factors identified by the defendant failed to prove that others are responsible for the victim's damages if other siblings grew up in the same household and did not suffer the same symptoms. The plaintiff's lawyer can also provide evidence including the victim's lengthy medical record history of lead testing that began at an early age. The documents might correlate with the victim's behavioral difficulties and their failure to remain focused in school as they matured. The plaintiff's attorney must prove a preponderance of evidence that the correlation between ingesting or inhaling lead/lead dust and the child's diminishing health were caused by lead poisoning. Every child or adult exposed to lead can experience very diverse symptoms that affect their mind, reproductive and nervous systems, and organs including the intestines, bones, heart, and kidneys. There is a wide range of factors involved in the damage done by lead poisoning and various levels of exposure that produce varying results based on the length of time the individual was exposed, the frequency, and the severity of the exposure. If you believe that your child is suffering the side effects of lead poisoning, it is crucial to visit the child's pediatrician right away. The physician will likely verify the exposure through IV or finger stick blood sample tests. If the diagnosis for lead poisoning is definitive, it is essential to take corrective action immediately. Identifying the source of the contamination is critical to removing the source from the child's environment or removing the child if necessary. In many incidences, the child is exposed to toxic levels of lead at home because the structure was built before 1970 and contains lead-based paint on the interior or exterior walls. Other times, the child is exposed to lead through the municipal water delivered to the home, school, church or other structure through old lead pipes. Sometimes, the child suffers lead poisoning by handling toys or other objects at the house, school or other frequently visited locations. Occasionally, the source of lead contamination can be brought into the home by someone carrying in an object or bringing airborne dust that settled on their clothing. Federal law prohibits the use of lead in many of these products, but imported materials still contain significant amounts of lead. It may be possible to file a lawsuit against a product manufacturer if it is determined that your child's injuries are related to the company's product. A lawsuit might be pursued by the injured against the landlord or management company for their negligent maintenance of the premises if the child's lead poisoning was caused by ingesting paint in a home or apartment. Further, in some municipalities, laws are in place which may be used to strengthen a case as a code violation. In July 2012, the Times Union published a news article stating that a negotiated settlement was reached between the defendants (a property manager and landlord in Albany New York) and two siblings who suffered permanent brain damage. The settlement states that both brothers will receive $550,000. The parties reached the agreement before the case was heard at trial in the New York Supreme Court. Their actions finalize the lawsuit that was begun in 1993 when the boys lived with their mother on Grand Street in a second-floor apartment. This settlement came after an earlier $50,000 a negotiated agreement in a claim filed against the landlord's painter's estate. Why is Hiring an Attorney is Important? Personal injury attorneys who specialize in contamination injury cases build lawsuits for compensation by reviewing the child's medical records, lead analysis reports and obtaining the building's history. This information can be used during the evaluation process. Before the case is resolved through a negotiated settlement or a jury trial, the lawyer will hire qualified medical experts to prove why the child needs sufficient financial compensation. The defendants will hear evidence from the plaintiff's hired industrial hygienists and lead testers that conducted a comprehensive inspection of the home and are ready to provide professional testimony at trial. Typically, when the defense's attorneys hear all the evidence and review all medical records, they usually ask the plaintiff's attorneys to schedule a negotiation meeting. Negotiating the case out of court provides financial relief for the victim without the need to present evidence in front of a judge and jury. Resolving the lawsuit out of court is beneficial to both the plaintiff and the defendant. The defendants sidestep the legal process not to have their case heard in open court in front of an angry jury that might not look kindly on the defendant's negligence that caused permanent damage to a child. Ready to File a Lead Poisoning Injury Case? 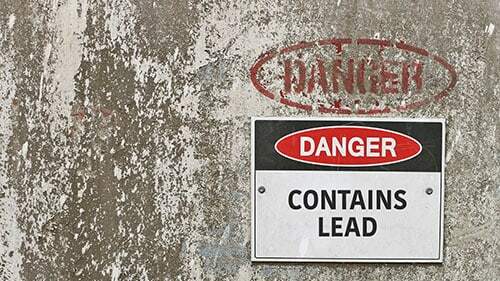 Even minimal exposure to lead can cause severe problems to a child's physical and mental health. If your attorney can prove that your child's lead poisoning is the result of another's negligence, your family can receive the financial compensation they deserve. It is important to note that not every child will display many of the common symptoms and side effects associated with lead poisoning for many months or years after their exposure. The diagnostician might not be able to identify physical issues, mental health problems, and nerve damage without confirmation from a blood sample test. The federal and state governments have enacted many of lead poisoning injury laws to provide a legal remedy for families with children injured while visiting or living in a structure constructed before the 1970s. Back then, medical science first identified a correlation between lead poisoning and behavioral challenges, difficulties in staying focused, reduced intelligence, and learning disabilities. Congress passed these laws to, in part, outlaw leaded gas and lead-based paint from the consumer market. If your children were exposed to toxic levels of lead, they might have to live with their injuries forever. The premises liability and lead poisoning injury attorneys at Rosenfeld Injury Lawyers LLC provide legal assistance to children and adults who have suffered severe harm through the exposure of elevated toxic lead levels. Our legal team has successfully prosecuted lead poisoning injury cases. We will work aggressively on behalf of our clients to ensure their families receive the fair compensation they deserve. Contact our attorneys today to schedule a free, no-obligation case consultation to discuss the merits of your monetary recovery claim. Our legal team accepts all personal injury case, wrongful death lawsuit, product liability suits and toxic exposure claims through contingency fee agreements. This arrangement postpones the payment of legal services until after we have successfully resolved your case through a jury trial or negotiated out of court settlement. We provide every client a “No Win/No-Fee” Guarantee, meaning if we are unable to secure financial compensation on your behalf you owe us nothing. All information you share with our law office remains confidential. How can I tell if my child is at risk for lead poisoning? How can I tell if my child is impacted by lead poisoning? How can I protect my family from lead exposure? Who can be held responsible for my child's elevated blood-lead levels? Can I bring a lawsuit to recover compensation for my child who has lead poisoning? How long does it take to get compensation for a lead poisoning case? Is there a cost to pursue a lead poisoning case for my child? How can I protect my children from lead paint? Who is responsible for my child's lead poisoning?